Our passions for both whiskey and history led us on a quest for heirloom corn varieties that were used by Missouri distilleries in the last century. We found what we were seeking in our own back yard. It all started when Tom Anderson, Master Distiller at Pinckney Bend Distillery was driving past an old-time corn crib, where a crew was shelling corn using equipment that has been obsolete for more than half a century. 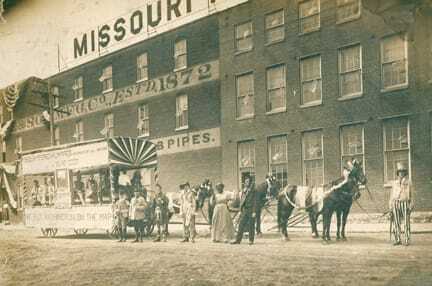 The operation was owned by a local company that produced corn cob pipes. They only use the cobs, and Tom wondered what happened to the corn, and if it would make good whiskey. 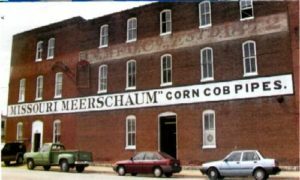 The Missouri Meerschaum Corn Cob Pipe Company in Washington MO has been producing pipes since 1869. Local farmers grew and shelled the corn, and Missouri Meerschaum provided a sizing ring. The pipe factory would buy any cob that was too large to pass thru the ring for as much as 4 cents per cob. In a time when cash money was hard to come by, this additional income made growing pipe corn particularly profitable for local farmers. In addition to cool-smoking, durable and inexpensive pipes, Pipe Corn was known to make excellent whiskey. This fact had been lost in the mists of time, but rediscovered a few years ago by Pinckney Bend Distillery, located in the neighboring town of New Haven MO. Today’s Pipe Corn is unique in that it is a non-GMO cross based on several varieties that have a long history specific to our area. Because of this local historic significance, we call it our Hybrid Heirloom. The field located just across the Missouri River from the distillery, in a fertile section of ground known as Pinckney Bottoms. It’s a match made in heaven. We are lucky that our friends have joined in and will be bringing you a weekly “in-depth” about corn, smoking, whiskey or (better yet) all of the above. Below, meet our friend, Dan. Holy Church of Gin and I converted most of them into pipe smokers. As brothers (and sisters) in the sin industry, we like to brag each other up to our patrons and give each other a mutually hard time, and it’s been a lot of fun to get to know them. But I’ve been rambling on, haven’t I? 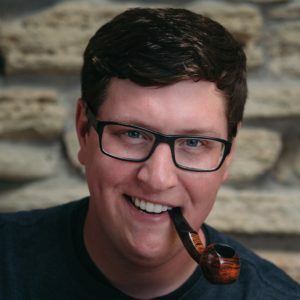 In the coming weeks and months, I’ll be looking forward to sharing some fun smoke and drink pairings, interesting histories, and collaborations between Pinckney Bend and Missouri Meerschaum Company. Thanks for having me aboard! And, for no reason whatsoever, here is a video of us taking that amazing pipe corn and making mash. This is one of the tasting room staffs favorite new cocktails. A simple play on a greyhound, we have been serving this one up for the past year. Our Hibiscus Gin really plays well with more bitter fare, so grapefruit is a refreshing option. Sink a touch of CLassic Tonic Syrup in and you have yourself quite a nice, refreshing cocktail. Build a collins glass of ice. Add Gin and grapefruit. Splash Tonic on top and let sink to bottom. Garnish with your choice. We suggest Lemon or Grapefruit, but cherries or rosemary offer different options. Gin has always been high proof. In fact, we don’t think you should trust one under 90 proof, but that’s just our personal opinion. 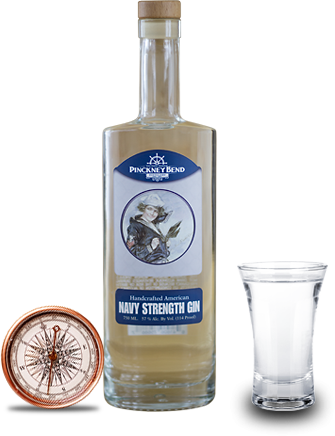 It is well documented that, historically, the Navy’s importance on the flavor of gin cannot be underestimated. In fact, there is quite a bit of evidence that suggest that the Navy was an important buyer of many early distilleries. With it’s easy access to spices and botanicals, as well as clean water, most of those early distilleries were based at major maritime cities where officers, who were often paid in Gin, were visiting. What follows is a history of Naval Gin and sorting fact from fiction. Before the invention of the hydrometer, alcohol was not easily measured. Luckily, the British Royal Navy created a way simple way to “prove” what they were buying was not diluted product. They mixed a small sample of the spirit with gunpowder to form a paste and try to ignite it. If the spirit was over a certain strength, the powder would light, and if under it wouldn’t. This was proof it was alcohol, and easily measurable. 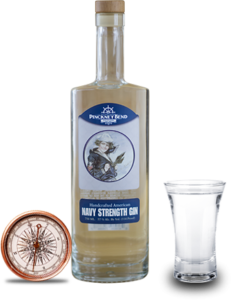 Hence the original Navy Strength Gin, which was called 100º UK proof Gin, was born. After there were more accurate ways of measuring alcohol, the navy continued to buy the spirits at 57%, as a matter of tradition. Thus, all 100º UK proof gins must be 114 proof. The term ‘Navy-Strength’ was created in 1993 by a branding consultant of Plymouth. The term neatly summarized all the history of 100º UK and thus a new subcategory was born. Since much of our mission involves ‘doing it the old way’ we latched on to this concept of naval strength. We took our American Gin botanicals and ramped up the juniper and coriander. What transpired is a dangerously smooth expression of a fiercely juniper flavor profile. With a touch of heat, but a smooth, clean finish this gin is perfect in just about any traditional cocktail. Today we launch our Tonic Tuesday. Each Tuesday, we will bring you another recipe using the Tonic Syrup as a component. We love our G&Ts, but also know that our Classic Tonic Syrup is too good to be used for just one thing. Its easy to use and works so well in a large array of cocktails. We are so excited to bring you our first Tonic Tuesday recipe, created by Operations Officer Tara Steffens. Don’t be scared by the “elderflower” syrup – there are many elderflower cordials out there to try – a fan favorite is St.-Germain. We make our own, but hey – that’s what we do. This is a floral martini that is more tart than sweet. You can use any type of sparkling wine, but we suggest something drier as to not overpower the floral. Cheers! Shake Gin, Lemon, Syrup and Elderflower over ice in a cocktail shaker. Strain into glass. Top with a splash of sparkling wine. Garnish with lemon zest or twist.